For three days from Thursday 5th December a fondue restaurant is opening near London Fields, with cheese from Neal's Yard, bread from the E5 Bakehouse, charcuterie from Borough Market, and wine from Borough Wines. They're taking over the Number One Cafe in Well St, for all three nights, and it's sure to be very popular. "Fondue with an epicurean twist is the order of the day at Ooh-Fondue, a new fondue pop up restaurant opening in Hackney this week. Ooh-Fondue, run by Moro chef Charlie Nicoll, is launching in Hackney for a limited run on 28th November. 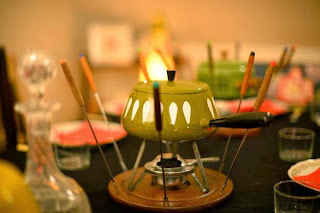 Ooh-Fondue is much more than an ironic nod to alpine holidays - it promises to be an authentic foodie experience. The pop up supports small local independent traders, sourcing its cheese from Neal’s Yard Dairy, bread from E5 Bakehouse, charcuterie from Borough Market and wine from Borough Wines. The restaurant’s founders are three friends and Hackney locals –Nicoll, who chefs at both Moro and sister restaurant Morito, Josie Martin, the front of house manager at Morito, and Michelle Booth, an advertising executive. The business is the brainchild of Josie Martin, who after enjoying some particularly delicious fondue on a night out, decided it was time the retro dish had a comeback, and persuaded her friends to join her in launching a pop-up dedicated to melted cheese."